Join Michelle Madow and family on Saturday, March 1, 2014 to celebrate the release of her first traditionally published novel, The Secret Diamond Sisters! The story is set in Las Vegas, so dress in festive attire, like you're about to hit up your favorite destination on the Vegas Strip. BookMania is an informative and entertaining event held annually to celebrate the written word, bringing authors from around the country to a community of booklovers who delight in hearing them share their story. It is free and open to the public. Michelle will be speaking on a young adult panel at 3:30 PM, called "Past, Present, and Future," and will be signing books. Books will be for sale at the event. This free annual Festival incites a passion for reading. Renew your interest in reading as the Festival authors are announced. Hear an author speak at the Festival and get inspired to borrow or buy the book, maybe even to write one of your own! Each year the UCF Book Festival draws thousands of readers of all ages. The Festival features internationally recognized authors and illustrators, book signings and sales, exhibitors, cooking demonstrations, book appraisals, and literary activities for all ages. Michelle will be doing a short reading from The Secret Diamond Sisters on the CFE Main Stage at 10:45 AM. Apart from that, she will be at her booth signing and selling The Secret Diamond Sisters and The Transcend Time Saga all day! Join us as 50 Young Adult and Middle-Grade fiction authors unite to sign books and speak with patrons. The Southern Kentucky Book Fest is one of the state's largest literary events. The Book Fest draws thousands of readers of all ages who welcome the occasion to meet their favorite authors and purchase signed copies of their books. Please note that all books signed at SOKY Book Fest must be purchased at the festival. No previously purchased books are allowed to be signed. The Ninth Annual Greater Rochester Teen Book Festival is FREE and open to everyone, but seating preference will be given to teen readers at all sessions! No registration is needed...just come and enjoy the day! I'm speaking on the new/debut author panel with Alexandra Coutts (Tumble and Fall), Tess Sharpe (Far From You), and Cristin Terrill (All Our Yesterdays). All authors will be autographing from 3:15pm - 5:00pm. The Secret Diamond Sisters paperbacks will be in the blogger swag bags for the Bloggers Conference on Wednesday, and I'll be at the Bloggers Conference mingling party on Wednesday from 3:45pm - 5:00pm to party and sign your copies! On Sunday, June 29, I'm signing advanced copies of Diamonds in the Rough at 11:00 AM in the Harlequin Booth! I will be on a Q&A panel and will be signing The Secret Diamond Sisters, which will be available to purchase at the event. Exact time to come! An all day event with a 60+ author book signing, a YA bowling party, and a NA/Adult mingling party. The book signing is open to the public and will be from 11:00 AM - 3:00 PM. I will also be at the YA bowling party, a ticketed event from 4:00 PM - 6:00 PM. I'll be speaking at 2:30 on the Teen Stage and signing books immediately afterward. I'm speaking on the "Thrill of a Good Mystery" panel at 12:00 PM. 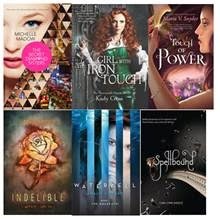 I'll be signing The Secret Diamond Sisters and Diamonds in the Rough at 1:00 PM in YA Signing Tent 2. Diamonds in the Rough will be sold one week early at this festival only! I'll be celebrating the release of Diamonds in the Rough in my hometown bookstore -- the Barnes & Noble in Pikesville, MD! I'll be signing copies of Diamonds in the Rough and The Secret Diamond Sisters. This event is free and there is no registration needed. There will be books available for purchase from The Book Carriage, and they will be selling books all day. The Book Carriage will accept cash and credit cards. You may bring some books from home for authors to sign. sessions 1 (1:00 PM to 1:50 PM) & 3 (3:00 PM to 3:50 PM). Michelle Madow, author of the Secret Diamond Sisters, will be visiting us. Find out from her what it's like to be an author, writing tips and tricks, and more. Book signing is immediately following panel presentation. All three books in The Secret Diamond Sisters series will be available to purchase. I'll be hanging out signing books and chatting with fans!